9:10 AM Hours, 9:30 AM Divine Liturgy, followed by coffee hour, and adult and children Church school. Many other services are also offered. Please see the Service and Events calendar on the parish webpage for more information. Orthodox Christians can worship anywhere, but a permanent location is desirable. Demographic studies and maps were obtained, and we found that Ballston Spa was the geographic center of the County, and that there were at least 10,000 ethnic Greeks and Slavs in Saratoga County. A 1% ethnic participation combined with converts and “friends” should yield a viable parish. Evangelization materials from OCA and Antiochian sources were employed. We explored hall and motel rentals, storefronts and shopping malls, and non-Orthodox Churches, several of whom offered to provide space. Fr Igor brought additional families to the group, increasing membership. Membership was defined as receiving the Sacraments and pledging whatever the member felt was fair. Tithing was and is encouraged. As a fund raiser, and to support a Monastery, we began selling New Skete Cheesecakes, which continues today. We believe that when finances are approached with the mission of God’s Church as the object, money is not a problem as “God provides.” Work was begun to incorporate the parish, and close contacts were maintained with our Diocese to assure conformance. One new family owned a summer home on Ballston Lake, and generously offered it for use. Like the earliest Biblical Christians, we found our first church in someone’s house. On Sunday, October 2, 1988, we celebrated our first Divine Liturgy as a community. Twelve people attended, eight of whom formed a four-part choir. We enjoy the talents of Matushka Burdikoff as an accomplished choir directress. Soon, the average Sunday Liturgy attendance quickly grew to 20 or more. We barely had room to move. We began a bulletin, and telephoned and and advertised for potential attendees. We believed that our services and music should all be in English, with our parishioners being from various Orthodox traditions and numerous converts that had non-Orthodox upbringings. Choir directors and friends provided extensive music, and we adopted a motif blending Slavonic, Greek, and Antiochian styles. Area Orthodox Churches were (and are) generous in the loan of ecclesiastical items, and providing names of families. We looked for property to purchase, and several Sundays were spent tramping through swamps, farm land, and a burned out house. None of the sites we looked at came to fruition, and we were rapidly out-growing the Lake house. We decided to look for larger temporary quarters. Friends in the Episcopal Diocese informed us that we could approach any church in the Diocese. Fr Richard Barrett invited us to Cavalry Church in Burnt Hills. Their beautiful church and fellowship hall was offered at a “what’s fair” rent. In December 1988 we started worshipping there, and were to remain there for three years. They even placed our service schedule on their sign board. We received the loan of large Icons from an Orthodox parish, which were employed in constructing a portable Iconostas. The Iconostas was ready for the third Sunday of Great Lent, 1989, when our parish hosted the Lenten Vesper Service of the Orthodox Brotherhood of the Capital District. It was interesting to erect and dismantle our “Church in a box” for every service. When Pascha was celebrated, we were able to process outside the church. We did receive one complaint for ringing the bells at midnight - they thought it was a fire! Our Agape meal was (and continues to be) an international delight given our varied ethnicity. (Ever have Irish scones and great Italian pasta dishes?) Piroghi making became an additional fund raiser. We will always be grateful to the community of Cavalry Episcopal for allowing us to share their home. A Sunday newspaper article told of the Milton Grange trying unsuccessfully to sell their property. We visited the building which had been basically vacant for two years, and was used most recently as a flea market. It was filthy, full of junk, and smelled like old socks. WE LOVED IT. We were in competition for the property with a barbershop chorus, an artist, and a garbage contractor. Truly God performs miracles, as the Grange accepted our offer. Further they insisted on a minimal down payment, holding the mortgage, and they even pay us to hold a monthly breakfast. We moved in October 1992 and began cleaning up and starting renovations. Many items have been obtained to decorate our church through the generosity of friends and parishioners. We added a portable classroom in the summer of 1996 to accomodate our growing Sunday School. In 2001, we purchased land on Eastline Rd in the town of Ballston as a future site for our church temple. A mission church is truly an inspiring and educational process. We’ve had families come…and go. Beloved friends and founders have moved away. We’ve joyfully celebrated the marriage of our friends and the Baptisms of their children. We’ve been saddened by the falling asleep of loved ones. In short we’ve truly lived and loved as a Christian community during our short existence. A lot of work remains to be done at our church. We hope to expand our outreach and increase our numbers. 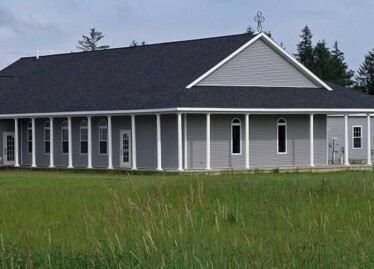 We purchased a 7 1/2 acre building site in the town of Ballston and have completed construction of the new church complex. We are looking forward to the day that we may help another new mission church spring forth. Where do people come from? GOD sends them. We don’t know where the Lord will lead us, but we simply pray that His work be done, and that He uses us as willing instruments to accomplish His work on earth.